I love celeriac and should eat more of it. 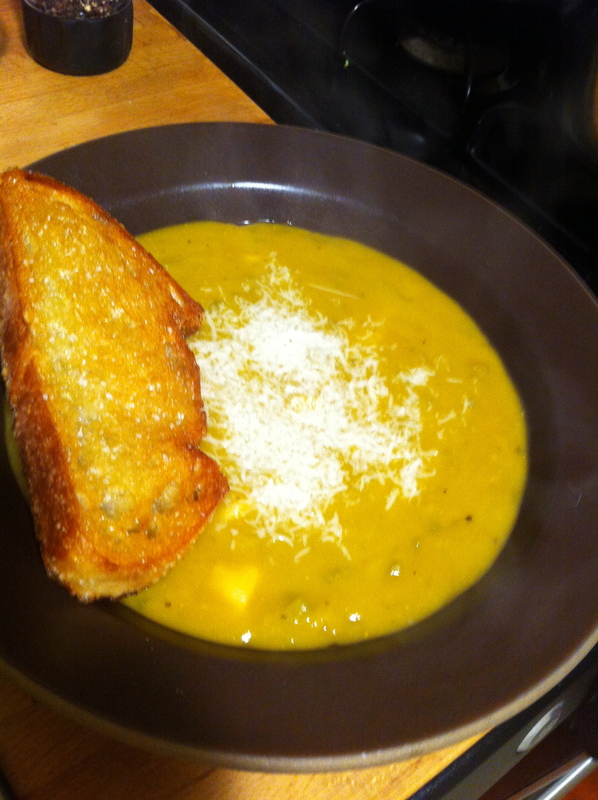 It’s perfect for soups – acts like a potato, but less starchy. It’s hard to describe the flavor – mild, kind of celery-ish, very delicate. Pairs well with other delicate flavors like fennel and leeks. I’ve made soups with it before, but this was a new recipe for me, from our old friend Deborah Madison, adapted from the Greens cookbook. It used a lot of our CSA ingredients, plus rosemary from the front yard. Sort and wash the split peas. Soak them overnight, or, if you forget, don’t fret. Cover with boiling water and soak them for at least an hour. Warm 3 T of the olive oil in a soup pot with bay leaves and rosemary and cook for about 3 minutes. add garlic and cook for 30 seconds (don’t let it brown). Add the veggies, salt and nutritional yeast and cook for 5 minutes. Pour in the wise and raise the heat to reduce. Add the drained peas with the water/ stock combo. Bring to a boil, cover and simmer for about 90 minutes, until peas are soft. Blend a few cups of the soup with an immersion blender, regular blender or food mill. Taste for salt and add some pepper. To make the croutons – warm the remaining 5 T of oil in a small skillet with the sprig of rosemary. Toast the slices of bread in the oil until brown. You can make small croutons too, but it’s easier to make the big kind. Garnish with the croutons & cheese. Yum!!!! 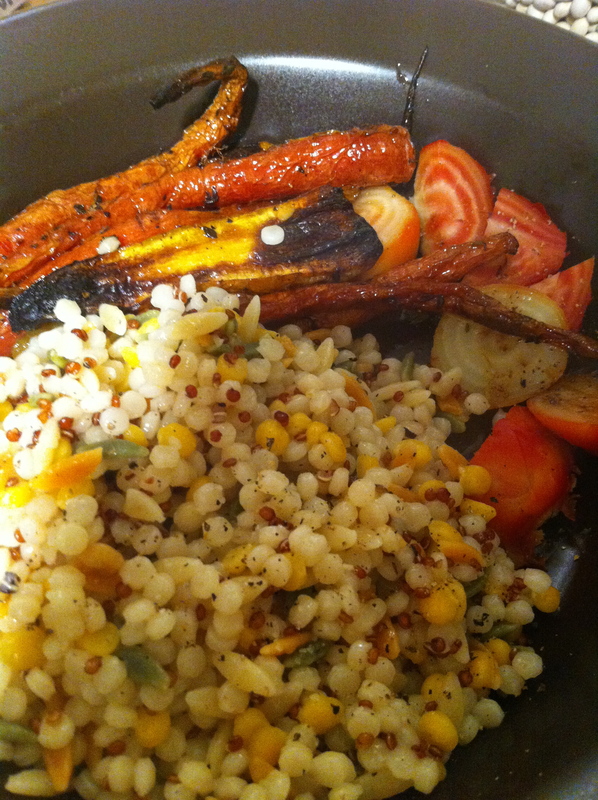 Carrots and Beets and Couscous, Oh My! We’ve been getting lots of beautiful young carrots in our CSA lately, so I roasted up a bunch. There’s no real recipe here. Just trim and clean the carrots (no peeling necessary), toss with some olive oil, S&P and leaves from a few thyme branches and roast at 425 for about 45 minutes, stirring often. When they’re done, toss with about a T of honey (we have this great stuff that is produced on a rooftop in downtown LA – doesn’t get more local than that!). Meanwhile I tossed in the young beets, wrapped in foil and cooked them at the same time. 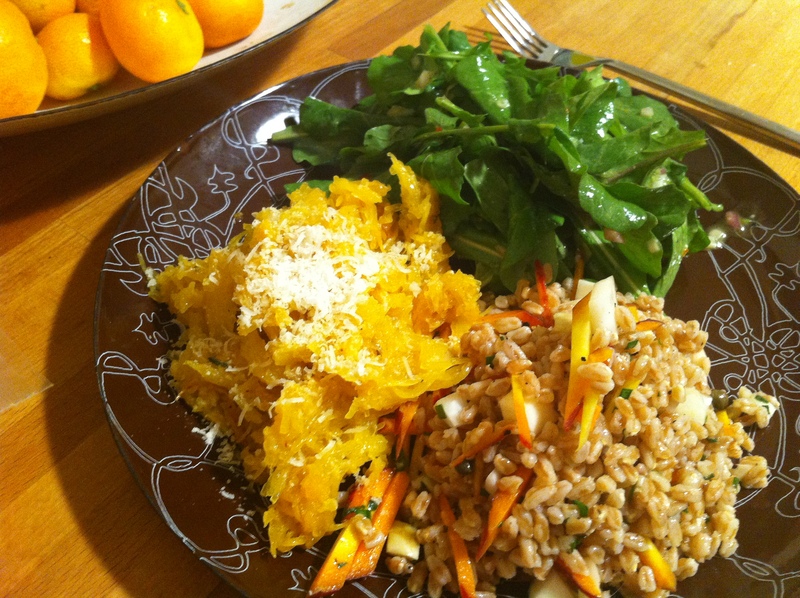 We made some couscous to accompany the veg – tossed with some Meyer lemon juice and topped with some parmesan. Um, yum! There is a ridiculous amount of butter in this recipe, and yes, we ate the whole thing (serves 2 to 4 people). There is also a ridiculous amount of broccoli and cauliflower in this recipe, which should counter the effects of the butter, one would hope. From the Greens cookbook. If you’re feeling super special, you can make this with Deborah Madison’s fresh herb pasta recipe, or if you’re looking for a quick weeknight recipe, some herbed linguine from Trader Joe’s does the trick. Cream 4 T of the butter with the mustard, shallots, garlic, vinegar and parsley (if using) and set aside to let flavors mingle. For the bread crumbs: melt the remaining butter, add the bread crumbs and fry until they are crisp and brown. This makes a lot of breadcrumbs – we saved some to top soup later in the week. Bring a large pot of water to bowl. Melt the mustard butter in a wide skillet. Throw the broccoli and cauliflower into the boiling water and cook for about 1 minute. Scoop them out and add to the mustard butter. Cook the pasta according to directions. Add cooked pasta and lemon peel to the butter/ veg mix and toss well, season with S&P. 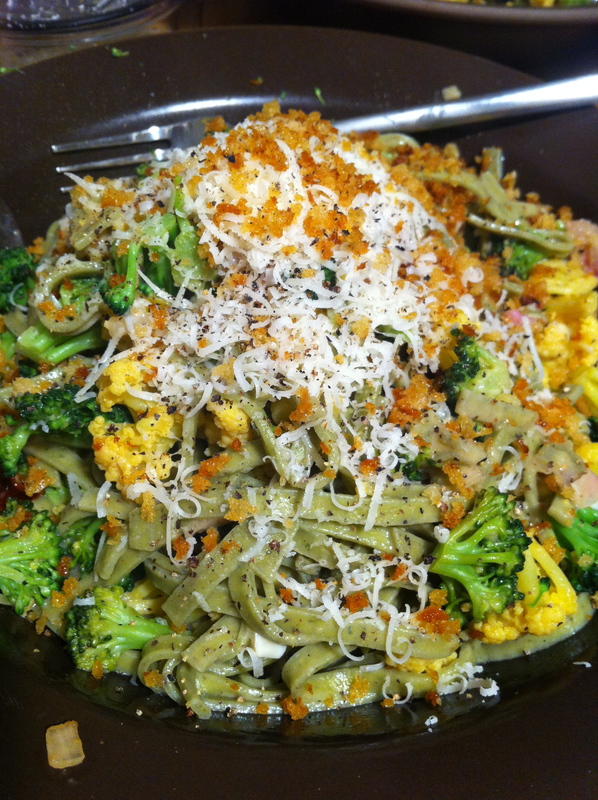 Serve topped with the crunchy breadcrumbs and some parmesan. Do not think of how much butter you’re consuming and enjoy with some white wine! 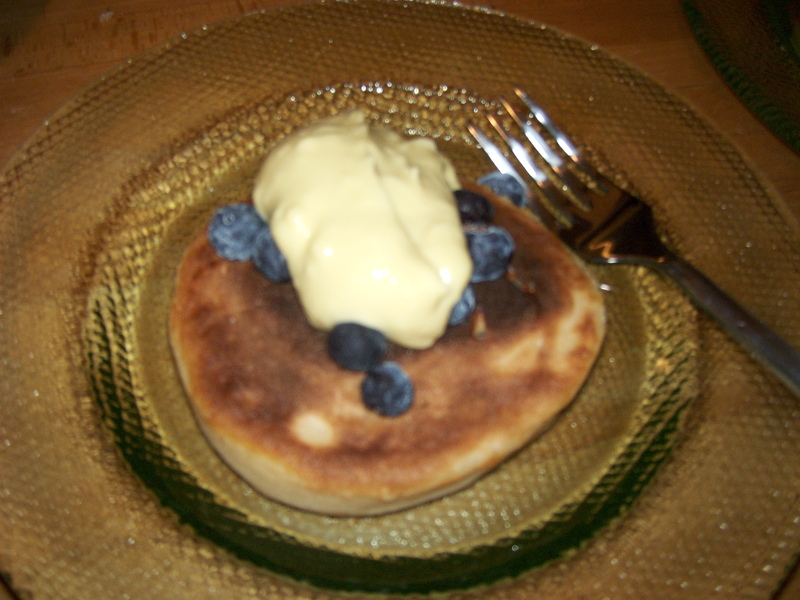 In an effort to eat healthy in 2011, we made this delicious recipe from Epicurious. There are a lot of pieces to put together, but in the end, it’s a simple, delicious, healthful soup. Bring broth and 3 cups water to simmer in large pot over medium heat. Add cilantro, mushrooms, sliced ginger, and lemongrass. Cover; simmer until mushrooms are tender, about 30 minutes. Rinse kombu; add to broth. Simmer 1 minute. Using tongs, remove kombu and mushrooms; discard kombu. Transfer mushrooms to work surface; cut off stems and discard. Cut each mushroom into 3 to 4 strips. Strain broth through fine-mesh strainer into another large pot; discard solids in strainer. Add tamari and rice vinegar to broth. DO AHEAD: Can be made 1 day ahead. Cover and chill mushrooms. Cool, cover, and chill broth. Bring large pot of salted water to boil. Cook yams until just tender, 4 to 5 minutes. Using skimmer, transfer to medium bowl. Cook snow peas, cabbage, and carrots separately until crisp-tender (snow peas, 30 seconds; cabbage, 1 1/2 minutes; carrots, 2 minutes). Using skimmer, transfer vegetables to separate bowls. Reserve cooking liquid. DO AHEAD: Vegetables can be cooked 2 hours ahead. Let vegetables and liquid stand at room temperature. Bring cooking liquid to boil. Sprinkle with salt. Add noodles; cook until tender but still firm to bite, stirring often. Drain; rinse. Meanwhile, bring vegetable broth to simmer. Add green onions and ginger strips. Season with salt and pepper. Using tongs, divide noodles among bowls. 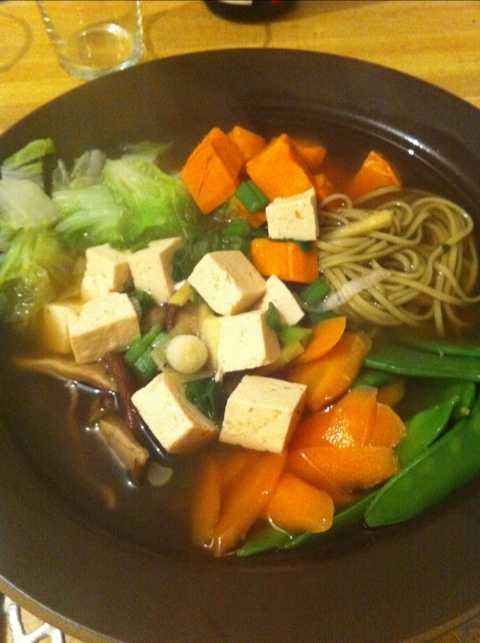 Divide mushrooms, yams, snow peas, cabbage, and carrots among bowls, each in separate mound. Divide tofu, if using, among bowls. Ladle broth over and serve, passing sambal oelek and tamari separately. Deborah Madison does it again. Somehow she combined two of my favorite ingredients (tarragon, sour cream) into a wonderful wintery dish that’s perfect for the end of a long holiday weekend (plus, it used many of our CSA veggies). This would be good for a potluck, since you can make much of this in advance. If you do not have a food processor with a grater attachment, run out and get one now! This recipe can easily be made with an old box grater, but a food processor really cuts down prep time and the amount of bloody knuckles you may suffer. 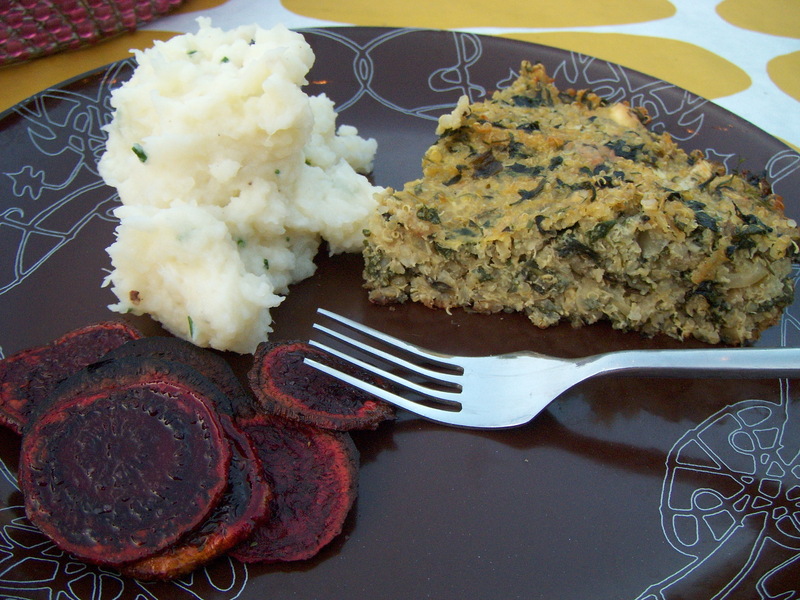 Adapted from Vegetarian Suppers. Oil a 9×12 inch gratin dish, or a couple smaller ones. Chop have of the rice finely and leave the rest whole. Mix the egg yolks with the milk and oil, then whisk in the flour, baking powder, 1/2 t salt and rice. Stir in the scallions and herbs and some pepper. Heat oil in wile skillet with the bay leaves over med-high. Add onion and tarragon, then beet, carrot, parsnip and cabbage. 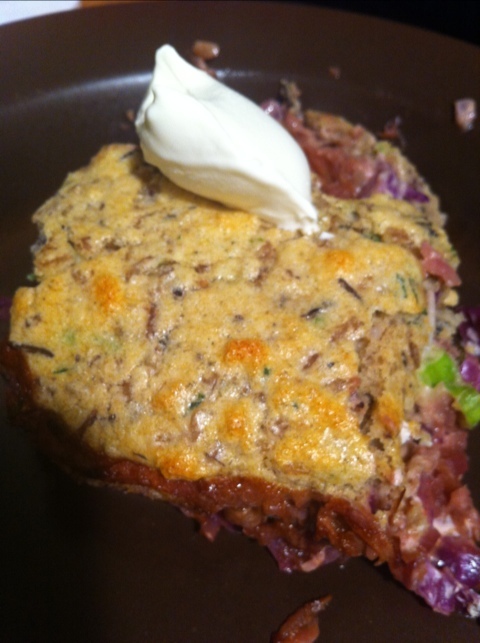 Season with 1 t salt and cook until cabbage is tender (stirring frequently). Halfway through the cooking, add the apple and 1/2 cup water. Once the veggies are tender, stir in the tomato paste and vinegar. toss well, season with pepper and turn off the heat. Add more water if it looks too dry. Stir in the nuts and then transfer to the baking dish(es). Place aside. Preheat oven to 375. When ready to bake, crumble goat cheese into the veggies and toss. Whip the egg whites with a pinch of salt until stiff and fold into the rice batter. Bake for 25 minutes. Enjoy with sour cream and a nice white wine. This recipe would also be good just as shredded root veggies, sauteed, and served with rice, etc. Had not really thought of grating root veggies before like this, but it’s so easy and delicious! We had a bounty of carrots this fall – all types – and had been talking with friends about finding an easy recipe that used up a lot of carrots. 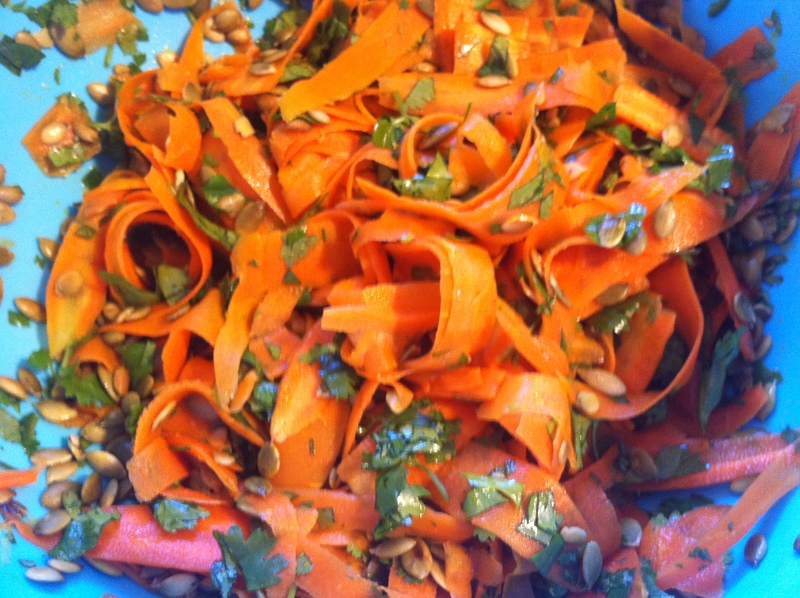 My friend said she had made this Sunburst Carrot Salad recipe from 101 Cookbooks so I gave it a try on Halloween. It was good, and used a lot of carrots. Start by washing the carrots. Use a vegetable peeler to shave each carrot into wide ribbons. (NOTE: This is harder than it sounds. You may waste some carrots, but they make for good snacks while you’re making the rest of the recipe. Also, we had a faulty peeler that I bought out of desperation at the grocery store. Now we have 2 fancy peelers and one faulty one.) If your carrots have beat up, dirty skins, peel them first before making ribbons. Heat a big splash of olive oil in a skillet over medium-high heat. Add a big pinch of salt and stir in the carrot ribbons. Saute for just 20 seconds or so – barely long enough to take the raw edge and a bit of crunch off the carrots. Quickly stir in the chiles and lemon zest. Remove from heat and stir in the cilantro, about one tablespoon of lemon juice, and then most of the pepitas. Taste. Add more salt and/or lemon juice if needed. 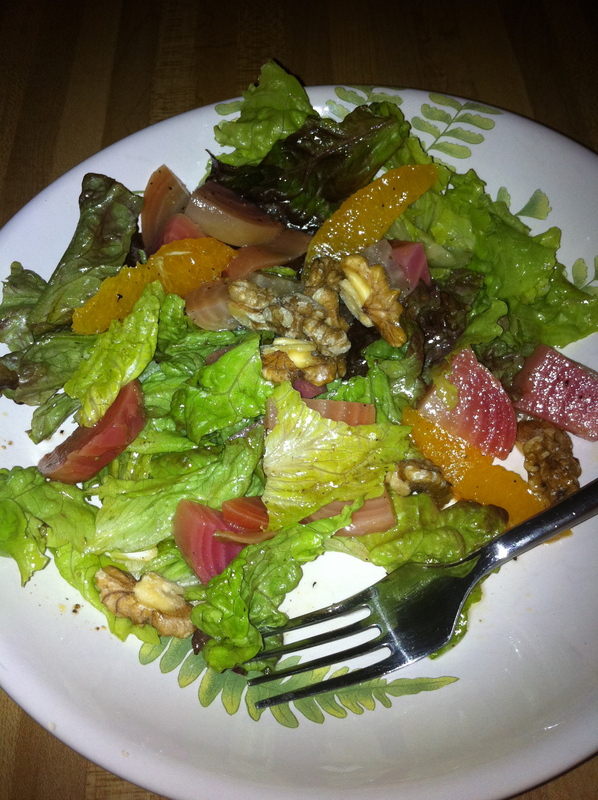 Garnish with remaining pepitas.